BOURNE, Mass. The top two commanders of an American-flagged ship hijacked by pirates off Somalia graduated from the Massachusetts Maritime Academy, and one of them recently predicted it was “a matter of time” before he confronted the outlaws of the ocean.Capt. Richard Phillips graduated from the school, his wife, Andrea, said Wednesday. A crew member told the AP that the ship had been restored to U.S. control, but that one crew member believed to be Phillips was still being held hostage.Reporters at the Phillips home in Underhill, Vt., were asked to leave shortly after word broke that a crew member was still being held by the pirates. She earlier said she heard around 7:30 a.m. that his ship had been hijacked.”I knew exactly where he was,” she said. “He had even made the comment that pirate activity was picking up.”She said she always worried about the reports.”I always hoped it wasn’t going to happen to us,” she said.His second in command, Capt. 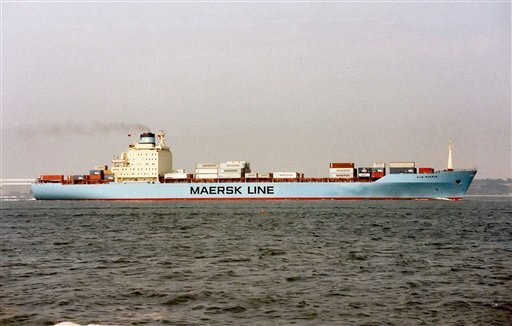 Shane Murphy, is also among the 20 Americans aboard the 17,000-ton Maersk Alabama, said his father, Capt. Joseph Murphy, a professor at the academy in Bourne.Murphy wrote on his Facebook profile that he worked in waters between Oman and Kenya.”These waters are infested with pirates that highjack (sic) ships daily,” Murphy wrote on the page, which features a photograph of him. “I feel like it’s only a matter of time before my number gets called.”Murphy’s wife, Serena Murphy, of Seekonk, Mass., told the AP her husband said by phone that he was OK, but that pirates had taken the captain off the ship and he was now in charge.Pentagon officials said Wednesday that the American crew of the Norfolk, Va.-based Maersk had retaken control of the ship, which was seized far off the Horn of Africa.The ship commander, Phillips, has been sailing in the dangerous waters “for quite some time,” his wife told The Associated Press.”They’ve been relatively safe, for the most part. I guess maybe it was inevitable,” Andrea Phillips said. “My husband is a pretty smart man. He knows the protocol. He’ll do what he needs to do to keep the crew safe.”Murphy, 33, is a 2001 graduate of the school who just a few weeks ago spoke to a class about the dangers of pirates, said his father.Joseph Murphy said his son was trained in antipiracy tactics at the academy. To evade pirates, ships can increase to full speed to outrun the pirates and are taught to extinguish deck lighting to make it difficult for pirates to see crew members.They also could use lighting to temporary blind the pirates or use high-pressure fire hoses to push them away, he said.Shane Murphy also received training with firearms and small-arms tactics, his father said.Murphy said he expects his son to visit the academy when he returns to the United States to tell other cadets about his experience. He believes his son will continue his career at sea.”You’ve got to get the job done,” he said. “This is another day at work.”Officials did not release the names of the other crew members.The Seafarers International Union said it represented 12 crewmembers, and Timothy Brown, president of the International Organization of Masters, Mates & Pilots, said three members of the union were onboard the ship. Neither would release names, saying not all family members had been notified.